Cultivada en Colombia; Alt. 850 - 2800 m.; Andes. Seeds 10–32/berry, light to dark brown, ovoid, discoidal or orbicular, 2.6–3.2 × 2–2.8 mm, reticulate; sclerotic granules absent. 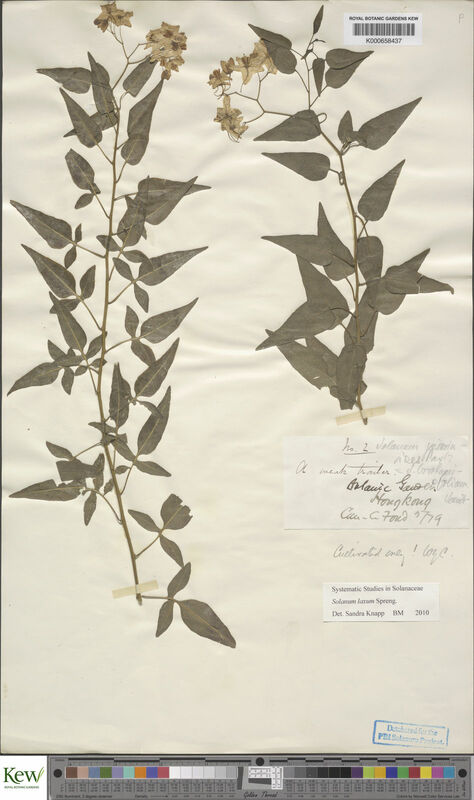 Darwin (1867, pages 41–43) used “ S. jasminoides” as an example of a true leaf climber in his paper “On the movement and habits of Climbing Plants”; he illustrated the tendril-like petioles, and experimented on both the time taken for the petioles to clasp sticks or stems and the effect of weights on their revolution. According to Friis (2006) “ S. jasminoides” superficially resembles the indigenous forest climber S. bendirianum Dammer, but can easily be distinguished by the often coiling petioles, the usually hastate or truncate leaf-bases, and the tufts of hairs in the axils of the primary veins. The synonymy of S. boerhaviifolium (originally spelt with one a by Sendtner but with two aa’s by later authors including Dunal (1852), Kuntze (1898) and Morton (1976)) is based on Sendtner’s protologue and his plate which shows many features typical of “ S. jasminoides”, including the characteristic leaf shape with curved petioles, together with the typical inflorescence and floral morphology. Most of the specimens identified as S. boerhaviifolium from Paraguay, Uruguay and Argentina also show these typical features, but some of those from Brazil are atypical with more ovate to rotund coriaceous leaves, without the curved petioles and dense domatia and sometimes with a dense long-haired pubescence. These might simply be indicative of an infraspecific variant, but clearly necessitate more analysis. Few synonyms of S. laxum have been included in this account, as this taxon is usually referred to as S. jasminoides in African literature. It is commonly known as the Potato Vine or -Climber and the Jasmine Nightshade. Several varieties and cultivars of “ S. jasminoides” have been recognised such as the white flowered var. album; the more floriferous var. floribundum; the larger and more robust inflorescenced var. grandiflorum and the white speckled leaved var. variegatum (fide Hepper, 1998). Sendtner’s plate of the synonymous S. boerhaviifolium illustrates infructescences whereas no fruiting material has been encountered in the herbarium. Fruiting is also apparently rare in cultivated material. 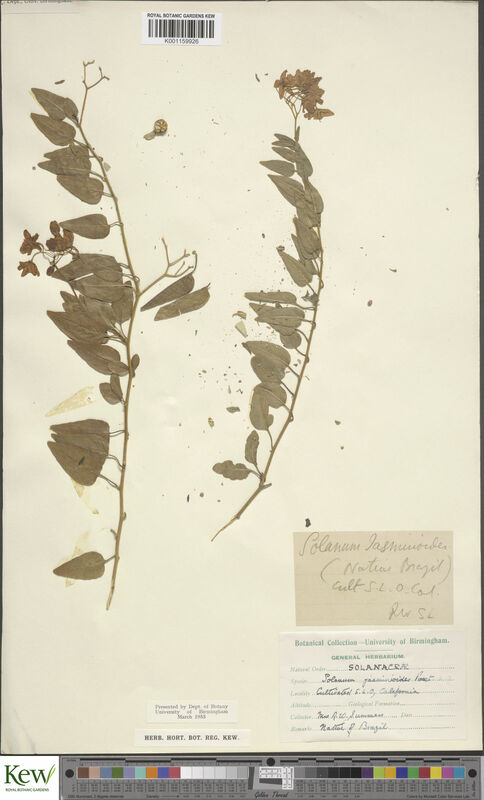 The fruiting measurements given above have been taken from specimens of the synonymous S. boerhaviifolium. Morton (1976) considered this a distinct species in Argentina, but apart from citing minutely pilose filaments and probable red berries, his distinguishing features are difficult to discern. Kuntze (1898) subdivided Paxton’s S. jasminoides into a several varieties and forms – all apparently from Bolivia. Morton (1976) synonymised some of these under S. boerhaviifolium var . boerhaviifolium whilst also describing a new variety var. calvum Morton, simultaneously mentioning that this might be conspecific with S. jasminoides Pax. var. boerhaviifolium. The latter is the only one of Kuntze’s varieties to been included here, and it is unclear if these variants occur naturally in Bolivia or were introduced – as were cultivated specimens seen from Colombia.